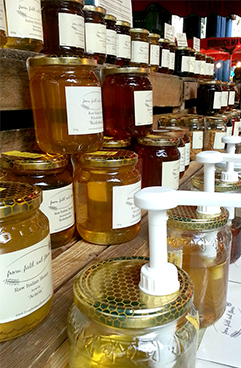 Looking at honey and flour on the supermarket shelves, there’s not much to distinguish one from the other. So we set up From Field and Flower to bring fantastic products to London. We specialise in products that we think reflect the flavours that come from the rolling hills, mountains, plains and woodlands of their origin. – Does it come from great, small producers who really care about their bees and crops? – Is it delicious as it is, or can it be made into something plate lickingly good? – Would we be happy to share it with our friends and family? THREE CROWN SQUARE, STONEY STRET, SE1. OPEN: EVERY MONDAY TO SATURDAY. This world famous market is a mecca for anyone interested in food – from street food to unusual ingredients to make your own dishes. We’ve spent many a happy afternoon in Borough as customers, and now we’re delighted to be there as traders. Find us in Three Crown Square, just off Stoney Street. We’re behind Ted’s Veg & opposite Chegworth Valley. Can’t make it to one of our markets? You can shop with us online. We offer a range of delivery options for UK and International addresses and accept all major credit and debit cards.